Just beside Hogan’s Alley, the mock town and training facility at the FBI Academy in Quantico, Virginia, there’s a cluster of modern two-story buildings with several classrooms. Inside one of the classrooms, new agent trainees are forming their squads for the morning when they receive word that an “explosion” has occurred in a nearby city. Over the previous few weeks, the squad has been using the skills they’ve learned to investigate a simulated hotel bombing and track down the criminals responsible for the attack. With this new report, trainees suspect that the events could be linked to terrorist activity. But before they can identify subjects, the squad needs to gather intelligence, conduct interviews, and dig up more clues. The agents’ partners in this effort are new FBI intelligence analysts who are training right alongside them. Analysts—the men and women who help gather, share, and make sense of information and intelligence from all corners of the globe—have never been more vital to the Bureau’s mission in this post-9/11 world. 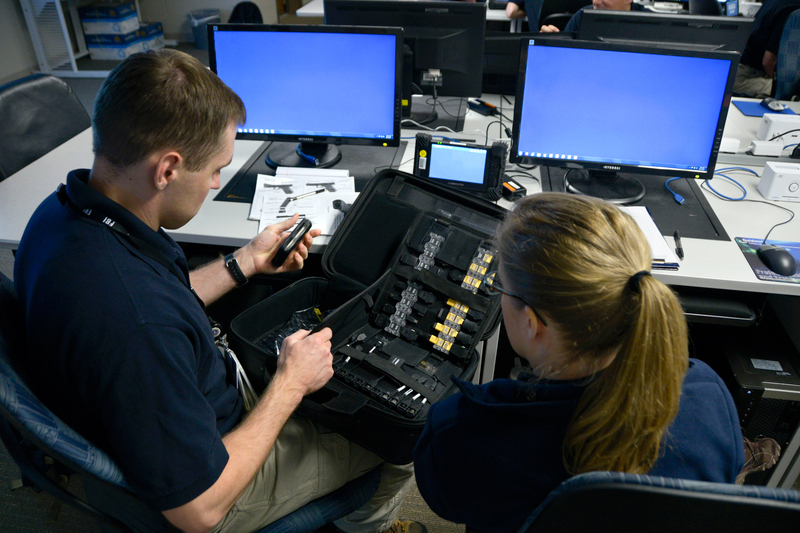 By integrating their training, the FBI is replicating what agents and analysts will experience in their coming cases and ensuring that seamless collaboration is part of their DNA from day one. From day one at the FBI Academy, new agents train alongside intelligence analysts to be more prepared for collaborative work in the field. Kellie Holland, a special agent and unit chief with the FBI’s Training Division, explains the importance of integrating new agents and intelligence analysts at the Academy and how it’s made a positive impact in the field. Later in the exercise, trainees begin questioning the wife of a suspected extremist (played by a local actor). She’s reluctant to talk at first, but by using their newly learned interviewing tactics based on building rapport, the new agents are slowly able to obtain the information they need to stop a potential terrorist attack. If it weren’t for the insight provided by the intelligence analysts in their squad, the trainees wouldn’t have been so successful. While trainees are integrated both inside and outside the classroom, specialized courses are provided to students based on what their roles will be in the field. For new agent trainees, the academic side of the training is demanding and includes a broad range of subjects that ground them in the fundamentals of law, ethics (see sidebar), behavioral science, interviewing and report writing, basic and advanced investigative and intelligence techniques, interrogation, and evidence collection. Agent trainees also receive more than 90 hours of instruction and practical exercises focused on tactics, operations planning, cooperating witnesses and informants, physical and electronic surveillance, undercover operations, and intelligence. The rigorous academics are vital to the future success of agent trainees. They will need to learn the basics of federal law, the U.S. Constitution, and the legal process. If agents don’t understand all of the details governing searches, questions could be raised during trial about the credibility of recovered evidence. The intelligence analysts will ultimately graduate before the agents after 12 weeks at Quantico. At that point, new agent trainees begin their tactical training and set their sights on the crooked criminals and gangs waiting for them in Hogan’s Alley. Rigorous academics are absolutely vital to the future success of agent trainees. 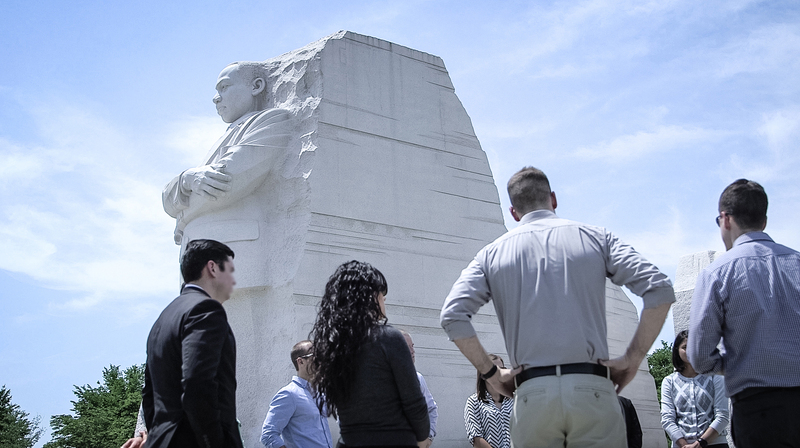 New agents and intelligence analysts visit the nation’s capital to view the Martin Luther King, Jr. Memorial and the United States Holocaust Memorial Museum as part of their ethics training at the FBI Academy. FBI agents wield substantial law enforcement powers, including the ability to make arrests and, along with analysts, to build a case that can put a person behind bars. That’s why agents and analysts must be grounded in the fundamental principles of ethics and place the utmost value in protecting the innocent and upholding the rule of law. As part of their ethics training, new agent and analyst trainees make two excursions to the nation’s capital that drive home the importance of protecting the public and preventing the abuse of authority. The first trip, instituted by the Bureau in April 2000, is a specialized tour of the United States Holocaust Memorial Museum. After the tour, agents and analysts talk with museum representatives about how the Nazis took power in Germany in 1933 with the help of civilian police and the horrors that can occur when law enforcement fails to protect and serve with compassion and fairness. In a second trip, which was incorporated into FBI Academy training in August 2014, students visit the Martin Luther King, Jr. Memorial. The program—put together in partnership with the Memorial Foundation and the National Park Service—reminds trainees of past FBI mistakes, the importance of civil rights for all, and the need for oversight and accountability.